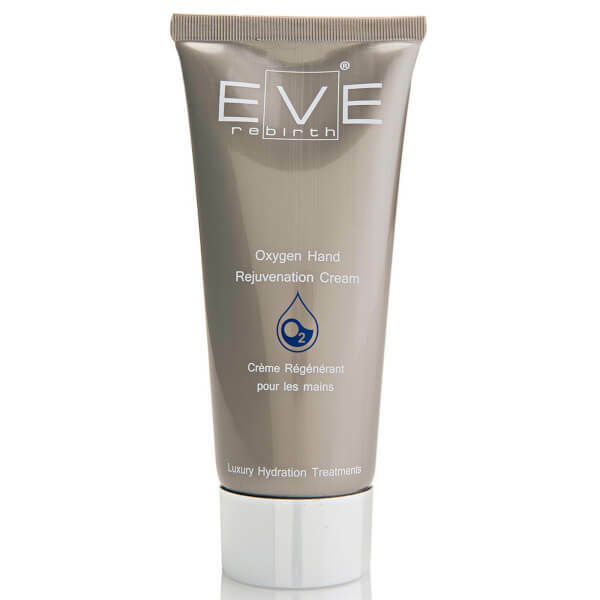 Treat hardworking hands to the nourishing properties of Eve Rebirth Oxygen Hand Rejuvenation Cream, a hydrating hand cream infused with an Oxygenating Complex to help energise and protect skin. Helping to restore dry, ageing skin, the hand cream combines protective and moisturising ingredients to nourish and safeguard; its dose of Vitamin E keeps skin protected against the environment, and emollient Rice Bran Oil hydrates to leave chapped hands feeling supple and replenished. Reinforcing the skin's natural barrier, it will protect against sudden temperature changes and increase elasticity for younger, purified and visibly smoother-looking hands. Apply to the palms and backs of your hands anytime they feel dry or rough. Massage with round movements until complete absorption. Aqua (Water), Glycerin, Coco-Caprylate, Corn Starch Modified, Cetearyl Alcohol, Cetyl Alcohol, Allantoin, Tocopherol, Tocopheryl Acetate, Yeast Ferment Extract, Glycogen, Magnesium Ascorbyl Phosphate, Butyrospermum Parkii (Shea Butter), Oryza Sativa (Rice) Bran Oil, Hydrogenated Coco-Glycerides, Helianthus Annuus (Sunflower) Extract, Jojoba Esters, Mannitol, Helianthus Annuus (Sunflower) Seed Oil, Octyldodecanol, Polyglyceryl-6 Distearate, Polyglyceryl-3 Beeswax, Tetrasodium Glutamate Diacetate, Parfum (Fragrance), Sodium Polyacrylate, Ceteareth-20, Dimethicone, Phenoxyethanol, Ethylhexylglycerin.